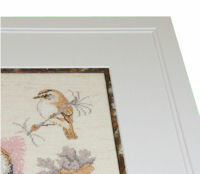 Finding out more about picture framing offers real benefits. You can significantly influence the life and impact of your artwork by making good choices. Whether starting from scratch or giving a face-lift to an existing piece of framed artwork, the processes are very similar. You need to spend time on planning and design to achieve the look you are after. There are 3 elements that should drive your ideas. Limitations posed from the original treatment. This is the most subjective of the three elements, with decisions being influenced by the artwork itself. Consideration is given to the subject matter of the art: what shades and tones bring the right degree of emphasis without overwhelming the art. 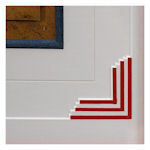 The balance between choices of moulding styles and mount colours can attract or distract the eye. Even consideration of where it will eventually hang and what is going on around it will also have a bearing. A more traditional look requires a warmer, stronger colour palette: a more contemporary feel is of achieved with minimal colours and clean lines. Different styles of artwork make varying practical demands on the framing. With needle craft, the issue of attaching and supporting a piece sympathetically, ready for framing, is foundation for the structure of the framing. Whether, pinning, lacing or using a more specialised system, these will always require added depth in the frame. The good news is that there are plenty of deep-rebate mouldings around to offer the right look as well as space to do more than just hold the piece in place. Having dealt with that essential part, the rest is about “art”. Think about layers and materials: we all know about double mounts, but what about putting space between the layers to create shadows and depth? Do you stick with traditional rectangular mounts or should you look at more “sculptural” designs? What about deep bevels, slips or fillets to create space away from the glass? A real issue can be what you find inside an existing frame. Some reworked pieces pose headaches from the start. Fabric stuck down onto board is difficult to lift, often stained by the adhesive and less pliable: re-stretching over a clean surface is awkward. Artwork, cut very close to the edge, then needs a “surround” sewn in, to provide the material for stretching. You discover chevrons of material cut out of corners, to avoid folds behind the board. These start a run if stretching, so need to be strengthened before starting work. Because of these unfortunate surprises, what you wanted to do and what you can do may be different. An unfortunate truth in framing circles is that needlecraft is seen as craft rather than art. Framing becomes a “housing” for hanging something on the wall, “dressed” in the design equivalent of a pair of old slippers. For the situation to improve, you need to take control. Make the right choices, plan the look and the practical design yourself. 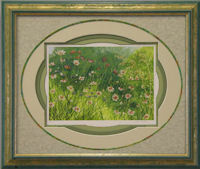 Even better, learn how to frame for yourself: then you can afford to indulge your art properly. 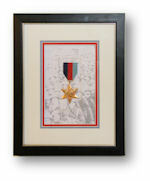 At UK School of Framing we are specialists. We know how to help you make the most of your art. We know how to frame fabrics. To start your own framing, have a look at one of our framing (Art & Photography) weekends: these give you all the necessary skills for building frames and creating artistic mounts. Follow that with one of our Framing Fabrics days where you explore a whole range of methods of attaching, supporting and presenting all forms of fabric based art. Posted on: 08-Dec-2009@08:09:27, updated on: 08-Dec-2009@08:09:27. 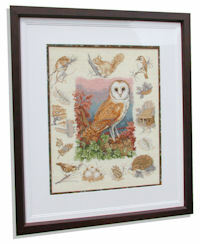 Bearing in mind the amount of time taken in producing a piece of cross-stitch, needlepoint or tapestry, surely it’s worth taking care with the framing? Framing any fabric requires a little bit more care in the planning stages and a few additional practical skills. It may take a little longer, but, done properly it makes such a difference to your work … and it is not that difficult. So why not have a go yourself? UK School of Framing is running a “special” for all needle workers – Basics of fabric framing, 20th February 2010 in Beaconsfield. 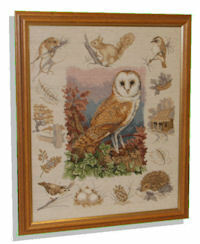 You bring along prepared needlework (guidance will be given) and we will take you through the whole process of framing it. 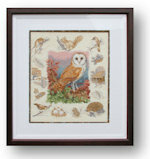 You leave knowing how to frame the rest of your pieces and have one completed, ready for hanging. 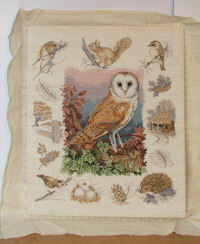 For more detail click Fabric Framing Special. If you want to take it further, the Mount Cutting & Decoration course on the 21st February will add a whole range of presentation skills, whilst the Stretching & Framing Canvas Based Art on the 22nd February may appeal to people working on larger scale items. Later in 2010 we will be running a Framing Fabrics day, where you can learn more of the skills involved in this work, as well as trying out a framing project, from planning to completion. 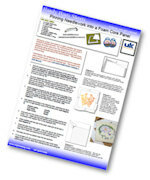 For more about all of our courses visit the UK School of Framing home page. Posted on: 08-Dec-2009@07:56:25, updated on: 08-Dec-2009@07:56:25. There is absolutely no doubt that all who entered the Summer Holidays Picture Framing Competition produced pieces of an exceptional standard. The finalists' work, exhibited at the Summer Open Day in Beaconsfield on Saturday, drew admiring scrutiny and prompted really positive comments from all of our visitors. The exhibition voting also reflected how tight things were: all of the finalists received votes for either 1st, 2nd or third place. In fact it really did go right to the wire, with the winner, Ian Oliver taking the lead on the last couple of ballot papers. 1st Place: Ian Oliver - "All Washed Up"
2nd Place: Janet Rudkin - "Bygone Summer Days"
3rd Place: Nikki Brearley - "Beach Huts in Drift Wood"
We have always prided ourselves on the fact that the depth and breadth of the UK School of Framing training programme provide a great launch pad for your own picture framing. 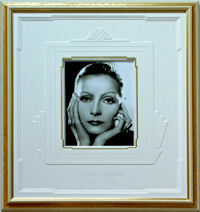 Being able to showcase work from people who started and developed their framing with us is a great source of pleasure. We aim to make this an annual event, so now is an ideal time to see where we can help you hone your skills in readiness. In the meantime, read on to discover what motivated our winners' designs. We hope to bring you more detailed project information about the pieces later in the year. Summer Holidays for me are not about lazing around on a sunny beach, but I’m more likely to be found wandering around a windy, deserted beach somewhere, with my camera - looking for a picture. 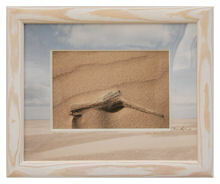 As soon as I saw the competition title, I thought of this image of a semi-submerged bleached bit of driftwood. The moulding more or less chose itself, as it looks just like driftwood - especially with the addition of liming wax. It’s a moulding I have used before, because of it’s texture. The framing is straight forward, except I used plastic glass for safety. For the mount I decided to try something a little different. Using an image from the same set as the driftwood main image, I printed a faded version directly on to the mountboard to give a feel for the place, before making the double mount in the normal way. Corner detail of moulding & mount. The theme of Summer Holidays reminded me of school days and looking forward to having a holiday by the seaside. I think a Punch & Judy show epitomises having fun on a beach in the summer even though it may not be quite PC. Part of the inspiration for my piece came after attending David Wilkie's course in July. I came away from the course 'buzzing' with ideas - the techniques that David demonstrated were amazing! The ideas for the colours, backing board and stripes came from the picture and the strong blues and reds and the bright white gives it a sunny, summery feel. The gold foil backing board reminded me of glistening sand and the moulding, although finished, looks and feels like bleached wood you sometimes find in seaside towns. The main problem I had to overcome was the lack of depth in the frame rebate. I overcame this by using a smaller plain moulding reversed, which I screwed to the back of the frame. After deliberating for some time over taping I decided to tape the join between the two mouldings to avoid dust particles entering. The image of the beach huts is one that I took a number of years ago and have always thought just seemed iconic of a traditional British summer. It is also bright, colourful and eye catching and I felt I could pick up on the colours and shapes within the picture and bring them into the mount design. Summer Holidays: there are many things that spring to mind when thinking of summer holidays – some obvious and some not so obvious, but having chosen the image I wanted to create a piece of work where each element of the frame picked up on a felling, a colour, or a texture that can be associated with holidays. I wanted to try and bring out the freshness and the clean rustic feel of the seaside with the moulding, which is why I chose something that picked up on the bleached, smooth and natural fell of driftwood. I liked the shapes of the roofs of the beach huts and really wanted to include and mirror the angles of these in the mount. But then create a softer feel at the bottom with an indication of the beach. The bright and strong colours of the beach huts I tried to pick up with the inner mount – but keeping it narrow so it did not become too strong and overpowering. Posted on: 14-Sep-2009@10:37:27, updated on: 14-Sep-2009@10:37:27. 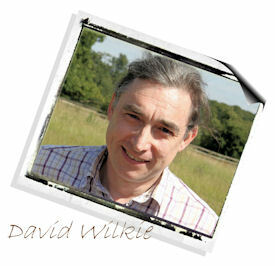 With the deadline for our framing competition getting ever nearer, David Wilkie has offered to give you an insight into his methods for getting the grey cells in gear. With his background of success in the very top levels of competition framing, it must be worth reading! I've done quite a few framing competitions over the years and been fortunate enough to win a few too. It’s always difficult and I inevitably leave things until the last minute before finalising the design: I'm constantly waiting for that piece of brilliant inspiration. It rarely arrives so the answer is “good, old hard work” … very enjoyable hard work. For the new competition from DIY the subject is Summer Holidays. I usually start with frustration and a disconcerting lack of ideas. With a set piece of art you already have something to work from. In this case we almost have a blank canvas, with only a general direction in which to head. Before coming up with a design, you need something in mind to work with: it can be a picture, an object or an idea. All you need to do then is find the actual “picture or object”. Whatever it is, it needs to have impact in colour, texture or subject matter. Having a delicate, soft or subtle image is going to limit your options. Even though this is a framing competition I still think the item being framed should be the focus of attention. At the same time you want to show off some framing skills so the more powerful the object being framed, the more you can do with your creative ideas: it will give you more options. Then there are the judges. What are they looking for? What are the aims of the competition and how will it be marked? First read the rules, check out the conditions: what’s in them that can help you get the right balance? Are they looking for workmanship, creative ideas or both? A lesson I learnt early on was don't think about what anyone else is going to do. Even if they have the same idea, they are not going to produce identical artwork. Just because it is the first thing you thought of, don't think everyone else will be thinking the same. If you have a good idea, go with it. Choose a subject that gives you colours, shapes, textures or combinations. Use these to inspire your design and extend the character of your picture or object into the mount and frame. I really love the freedom a competition can give you: no customers to dictate colour, style and taste. I often have an overall effect in mind before coming up with a detailed design. 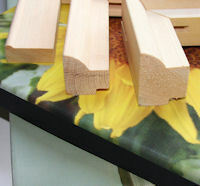 This often involves developing and trying new techniques; for example paint finishes, or solving problems like the right cutting order for an intricate mount. Learn new skills, push the boundaries and be creative. This is the art industry, so be artistic be creative. 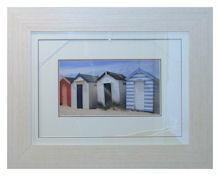 Framing is also a craft so practice quality workmanship too. But most of all have a go, do something to be proud of, enjoy it and create something you'd want to hang on your own wall. Fancy having a go? Check out the Summer Holidays competition. Posted on: 05-Aug-2009@09:19:06, updated on: 05-Aug-2009@10:24:30. For a number of keen photographers, finding a better print quality may not be that easy. If you look at the difference between good quality photo prints and the amazing look of fine art photography in galleries … the gap remains a chasm! What you may be looking for is giclée printing on top quality papers. For example, one of your prints on a fine art paper can maintain the subtle lighter shades, without loosing definition in shadows. Having had our print and imaging links running for a couple of months, we thought we’d find out how results compare with other print systems. Here’s one personal view of the process. The reason I had a look at the DIYframing prints was to see if a different paper would make any difference. I had decided not to bother with large format printers: running costs and developing the technical knowledge are expensive, time consuming and not particularly “future – proof”. I would rather spend a bit more on the print and let the experts absorb costs and professional development hassles. I have used a number of very good on-line photo print sites. Enlarged prints on the various photo papers available have always been really good and (I thought) as much as I wanted. What changed my opinion was the quality of a couple of canvas prints I’d had done. They looked richer: colour tones were more interesting and seemed to have more depth. Then at Focus On Imaging I saw a whole range of images on a fine art paper. Colours were both more intense and subtle at the same time – a completely different look. I was also told that these were giclée prints. In the back of my mind I had a vague idea that this meant better quality in some way. There are real reasons why this type of print is better. The range of, and transition between, shades are far better than traditional methods. Light fastness is also improved – in fact there’s plenty to read up, about this, on all sorts of sites if you are interested. The first thing I noticed about the print range offered on the DIY site is that all of the prints are giclée prints, whether on gloss, matt or fine art paper. The process from start to finish was not what I was used to: no simple on-line uploads and wait for a “tube” to arrive. It was a slightly more time consuming process, but actually that was the start of, what I now see as, a real positive difference. As instructed from site guidance I produced a very large file of my chosen image: increasing the resolution to 300 dpi, setting the dimensions to the paper size (A3 – 440 mm wide) for the print and saving in TIF format. This produced a very large file (around 30 MB) that I saved to CD (and labelled). There is a printable PDF transfer form to complete indicating paper selection and any finish notes. I enclosed that with the CD and posted to the print room address. The other end of it is placing the order on the DIYframing site, which in fact is similar to their usual order process. The big difference with this system and the usual upload and print is that some one will give you a ring if they need any clarification about cropping, colour range … so you should always get what you asked for. Although I’ve not needed to yet, you can also contact the experts there and advise them of any particular preferences you have. In short, it is a bespoke service. It actually took 6 working days, start to finish. I ended up with probably the best print ever of one of my images. In theory it is not the best of my photos technically, but the print quality has taken it above what I had considered to be better shots. In fact, I can see I will end up having to reprint some of those. I have become a major fan of printing on fine art paper – something about pigs’ ears and purses springs to mind. I have also changed my mindset about costs, a little. I no longer see these as “reprints or enlargements”: they are original art prints. I would be happy to invest in somebody else’s limited edition print. Why not do the same for my own work? The only possible issue I have with the DIYframing site is that, maybe, the notion of quality printing does not come across on the site. Don’t let that put you off! If my experience is anything to judge by, it’s the photographic equivalent of seeing your name in lights. Posted on: 05-Aug-2009@09:55:26, updated on: 05-Aug-2009@09:55:26. 1st - £300 cash; 2nd £100 (DIYframing Vouchers); 3rd £50 (DIYframing Vouchers). 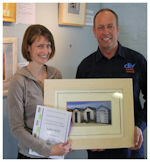 To qualify for entry, you must be a registered member of DIYframing … it is not too late to sign up. DIYframing employees (or their family members) will not be able to apply. Only one entry per person. Impact (15 points)– overall impact of the piece when first seen. It’s in this last area where you can give your opinion. Entries will also be judged for by visitors to the Open Day. The piece receiving most votes for 1st place will be awarded a further 50 points; 2nd, 30 points; 3rd, 15 points. These will be added on to the expert’s points to provide a final tally – the framing with the most points, wins! All projects will have to be sent or delivered to DIYframing in Beaconsfield: entrants will have to be responsible for all costs involved in that process. Closing date for entries: 3.00 pm, Tuesday 8th September. Posted on: 08-Jul-2009@06:45:08, updated on: 17-Jul-2009@06:36:57. We know it is going to be a brilliant day - just look at what's there! Remember entry and attendance of all events are free. We can confirm that we will be holding a FREE presentation / seminar at our Summer Open Day. The session will be a mixture of demonstration, information and discussion all around 3D framing. It will whet the appetite of people looking at trying out some projects of their own and offer some artistic and practical tips for some of you who have already made a start on framing. We also invite you to bring along ideas (or items) that you may want to frame – we might be able to offer some cunning plans. There will also be plenty of time to talk afterwards and see competition entries on display. 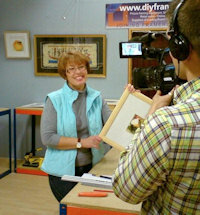 To register for a place at the 3D Framing seminar, please contact judy@diyframing.com. Priority will be given to those who book ahead. Posted on: 09-Jul-2009@07:28:35, updated on: 09-Jul-2009@07:28:35. At long last, our image transfer service is ready to go. It is never easy to do justice to a new venture especially one as good as this. But we’ll try. The aim is to extend the idea of framing your own artwork starting from the image production as well as planning and building the frame. 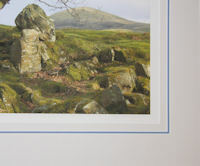 This new service offers several strands: giclée prints on a choice of fine art paper, photo paper or canvas. Whatever print medium you choose, we guarantee that the very best product and processes are being employed. Experienced staff will transfer images for printing from the CD you send in: any queries and they will be in touch to discuss exactly what you want. If you want a canvas image stretched ready for framing or as a gallery wrap we can do that too. 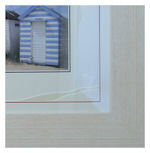 So, what we have developed is a bespoke imaging service as a start to your own bespoke framing. Of course images do not have to be limited to photography: you can scan all sorts of artwork, save to file and send in for transfer. We can even provide limited edition runs of your work. 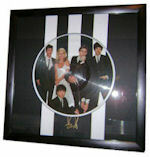 This has also given us the opporunity to group framing items in a more intuitive way. By recognising that, for many customers, printing and framing images on canvas will be the main reason for using this area of DIYframing we can make direct links. 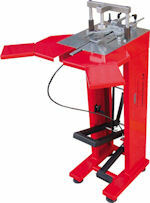 We have grouped together all of the materials, kit and hardware specific to this type of work. Click KIT to move to the designated area of our on-line store. To help make sense of it all there are several pages of information on our website, accessible from the new IMAGING icon on the home page. As well as detail about the processes and background to the service, there are links to resources, kit and materials used when framing canvas based artwork. 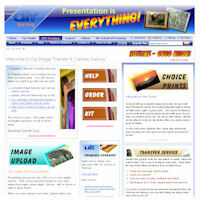 Click IMAGING SERVICE to check out the "base" page or HELP for information about preparing images for transfer. Orders are made in the usual way by choosing the image size to be printed and then the type of print from the drop down menu. Download a transfer form which you complete and send in with your CD Rom (with image files saved on it) to the address shown. Click ORDERS to see what the ordering system looks like. As always, please offer feedback about the service so that we can ensure we are making it work for you. Posted on: 02-Jun-2009@09:35:42, updated on: 02-Jun-2009@09:35:42. Posted on: 07-May-2009@06:41:21, updated on: 07-May-2009@06:41:21. Of all of the framing processes we teach, canvas stretching is certainly the most popular after, of course, our basics programme. It reflects the increase, especially amongst photographers, in having images enlarged and printed on to canvas to produce more dramatic framed artwork. The trend is also popular amongst customers looking for a more exciting feature item such as family and wedding portraits. The good news is that our next training weekend, featuring canvas stretching, runs from 20th – 22nd June. You can either start from scratch and book all 3 days or sign up for just the Canvas Stretching day on 22nd June. Posted on: 07-May-2009@06:37:53, updated on: 07-May-2009@06:37:53. Whenever we visit exhibitions and trade shows, we always offer visitors the chance to follow up their interest in picture framing by inviting them to attend a free seminar. The session is intended to inspire people to see the possibilities of earning money from picture framing. For some people they are looking at marketing their own work more profitably by adding value through the framing. Others wish to add a service to their existing business: it is easy to see how a package, involving mounted and framed pieces, would appeal to wedding and portrait photographers. Finally, some seem to undergo an epiphany, spotting the potential even for developing a bespoke picture framing business to create a major (or minor) income stream. The Framing Seminars explore the main themes involved in setting up a picture framing business. 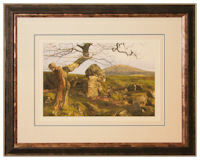 We demonstrate how to frame a picture, from the print to hanging, using professional framing kit. There is an insight into possible pricing systems, what elements these need to cover and a range of creative ideas for taking your own style of framing beyond the "basic" package. Our most recent session was on 25th March, following on from the Focus on Imaging and Hobbycrafts shows earlier in the month. It was very well attended (around 25 visitors) with a great deal of interest and enthusiasm for what was being shown. So, many thanks to all of those who made the seminar, and we will let the rest of you know as soon as our next freebie is arranged. But, remember places always go quickly. Posted on: 30-Mar-2009@11:10:24, updated on: 30-Mar-2009@11:10:24. This is the first time we have offered two of our more specialised development courses during a weekend. They are not intended as a two day package as there may be no cross over of interest between the two. The intention is to make it easier for you to take part in the days, without having to take time off work or loose holiday time. Posted on: 30-Mar-2009@10:52:32, updated on: 30-Mar-2009@10:52:32. Our next project card, as promised, shows one method of framing an Egyptian Papyrus. It introduces a few ideas to add to your framing repertoire: cutting mounts with offset corners; pass through tabs for supporting the artwork. The design aims to conjure up the period when Egyptology was a hitting the headlines in Edwardian times following the discovery of the tomb of Tutankhamun. It combines the golds, blues and blacks we associate with ancient Egyptian art as well as the offset corners, reminiscent of art deco styling. 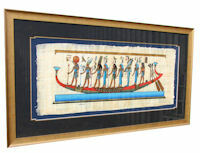 The papyrus is "float mounted" on a coloured backing allowing the full shape and distinctive edges to be visible. Spacers under the mount allow the artwork to be kept away from the glass, allowing all of the lumps and bumps to be accommodated without having to flatten it. The end result is quite distinctive and highly decorative. Those who have seen it hanging in the Beaconsfield training room have been well impressed! If you don't have anybody zooming out to Egypt for a holiday, there are many websites selling a whole range of Egyptian art: so there's nothing to stop you having a go. Posted on: 30-Mar-2009@10:23:17, updated on: 30-Mar-2009@10:23:17. Posted on: 03-Mar-2009@10:01:14, updated on: 03-Mar-2009@10:01:14. It is rare that something brand new comes on to the market. Even rarer is the chance to be in the front with its UK launch. 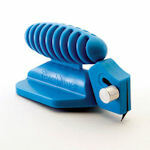 That's happened for DIYframing working with renowned mount cutter manufacturer, Logan Graphic, as the company launches its Foamwerk range of tools. 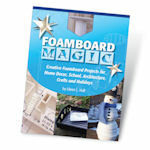 Foam board is light weight, but structurally sturdy, making it ideal in framing projects: spacers; deep bevels; support & construction; box making etc. An issue has always been how to get clean accurate cuts without tearing or puckering the core. The Foamwerk range of tools has completely overcome that problem. The straight edge, bevel edge and free style cutters will all have obvious applications for projects that we are already familiar with in bespoke framing. Less obvious would be rebate cutters and v-groovers. For these think structure rather than decoration. Light-weight boxes for combination frames, where you might want to house one 3D item in a piece that also features 2D images. Here, using a v-groove along a line allow foam board to be bent in on itself, making it possible to make a box out of one continuous panel of foam - no need to slice and tape. Rebates in spacer strips will allow you to attach a colour backing into the back of your spacer system. 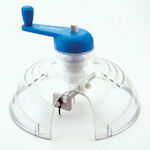 In fact, once you get going, there are all sorts of useful applications: circle cutters to create circular sink mounts. How about freestyle, deep-bevel mounts? Would that work - definitely worth an experiment? Of course anybody in the design industry, stage management / set design and of course architects will see endless applications in their work. The only problem you are likely to find with these tools is hanging on to them. Apart from the work applications and general craft uses, you will be losing out to your children taking them to finish off their design technology projects. Posted on: 03-Mar-2009@08:44:49, updated on: 03-Mar-2009@08:44:49. UK School of Framing is launching the first project of what will eventually become a library of picture framing ideas. Each month we will be creating a framed piece of artwork and providing an information sheet on how you can try it for yourself. A bit like a recipe card, you will be given a list of "ingredients" and methods used, as well as any training that might help with some of the skills involved. 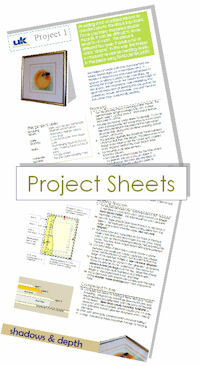 The "Project Cards" can be downloaded as a PDF. They are aimed at people who are familiar with how to use their kit and understand the basic processes of picture framing. There will, of course, be diagrams and illustrations but the explanations of methods are given in slightly broader terms than the "micro-steps" of the Handy Hints sheets. The first idea deals with using shadows in your mounts to create a bit of depth to your picture. It talks about adding spacers between mountboard layers, as well as making good creative choices for mouldings and mount colours. Click Shadows & Depth for a direct link. In order to download these projects, you will need to be registered on the DIYframing website. Always open to ideas, if you have a particular project you would like to see featured, please contact richard@diyframing.com. Next project will feature a stunning way of presenting an Egyptian papyrus. Posted on: 29-Jan-2009@10:13:41, updated on: 29-Jan-2009@10:13:41. 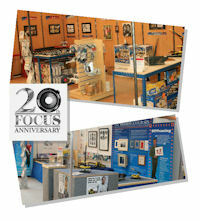 Focus on Imaging 2009 promises to be bigger and better than ever. It is always a great few days out with plenty for anyone involved in photography and creative imaging from enthusiast to professional. Once again we will have a large stand at the show with a massive range of kit being demonstrated and ready for purchase. * Please note that the offer only applies to cutters bought at the show and vouchers must be redeemed on our stand (B17) at the time of purchase. Also, when you buy a cutter at Focus on Imaging, you will automatically have the chance to take part in another first from DIYframing - a mount cutting seminar at Beaconsfield. The hints and tips demonstrated take you beyond what's shown on the packaged DVD. 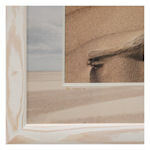 Another treat for visitors to the DIYframing stand will be the chance to attend a photography framing seminar. Early booking is essential and Focus visitors will get first refusal. We give advice on how to set up in framing photography and how it can make money. 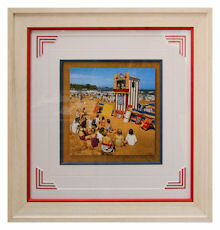 We demonstrate the framing process from planning to hanging, literally constructing a framed image as you watch. Finally, we provide a range of ideas for making your artwork stand out from the rest. There is always time for questions and you can visit our store to see the full range of kit and materials. Again you will need to visit our stand for full details and to reserve your place. Posted on: 28-Jan-2009@12:12:18, updated on: 28-Jan-2009@12:12:18.